What colour Jazz (2009-) do you own? 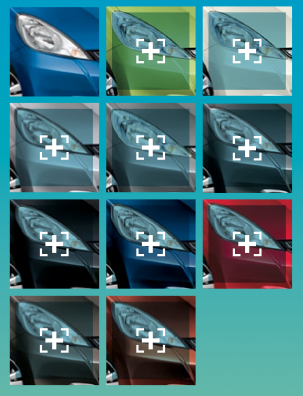 Update 21 Feb 2011 - added colours for the 2012 Jazz & Hybrid models. Clockwise from top left: Azure Blue Metallic, Fresh Lime Metallic*, Taffeta White*, Alabaster Silver Metallic, Storm Silver Metallic*, Polished Metal Metallic, Crystal Black Pearl, Deep Sapphire Blue Pearl, Milano Red, Urban Titanium Metallic, Ionised Bronze Metallic. Also...Orchid Pearl White (Si only). Re: What colour Jazz (2009-) do you own? I went for Cerulean Blue too as its something different. Would have went for Black had it not been that my previous car was a Nighthawk Black Civic and although that was lovely- it was only lovely if and when its been cleaned and dirt gets shown up dead easily. Storm Silver - I really like it as it matches with the privacy glass on the EX. As you can see from my picture - it is Cerulean Blue. It was either that or Alabaster Silver but really fancied a change and all press pictures of the Jazz in this shade of blue looked great. Still cant believe Honda have still persevered with pink! I really like my Storm Grey metallic colour. Looks good clean and dirty!! 1.4 i-DSI SE Manual 2006 Jazz - Its quietly charming. Returned and hopefully not forgotten! I am afraid to say my Jazz is Storm Silver, what appears to be the most popular colour. Is this poll by country, or global? The reason I ask is that I am currently working in Indonesia, where the Jazz is extremely popular, and they have a whole range of colours not available in UK. Solid white, solid black and a pale metalic green are three colours I have noted. This is absolutely fabulous colour and not commonly seen on the road. Not pink but really rose! There was a pink one at the garage waiting for collection when I collected mine. I'm not a big fan of pink cars in general, but it's a more subtle pink than some I've seen. Crystal Black Pearl. Well, it was not our favourite Jazz colour: we picked up a show model at a very decent discount and it was black. Black looks cool on Jazz, but if we would buy a new jazz, we (read: my wife ) would probably go for Sherbet Blue or Deep Sapphire Blue. I think, Jazz is one of few cars that looks great with almost any colour. Can you imagine a yellow, rose, or cerulean blue VW Golf or Merc? Jazz colours make it more funky or cooler, or more elegant, but never ridiculous. That's why it is so difficult to pick a colour for Jazz . Crystal Black Pearl. If I would buy it again (cleaning is of course my job), I would probably also go for silver storm. But must say that black colour stress out it's sport genes the most.